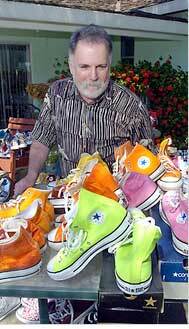 Doug Fraser looks over part of his collection of Chuck Taylor All Stars. He could wear one pair each week for two years and never duplicate. Golfer Tiger Woods wears only Nike. Basketball star Allen Iverson sports Reeboks. Converse can claim Lakewood Elementary School Principal Doug Fraser, whose shoe endorsement deal keeps him squeaking across the Modesto campus in a different pair of Chuck Taylor All Star high-tops every Friday. Fraser’s collection began with a letter to the company in 1993, when Fraser asked for a million-dollar endorsement deal. “If they pay that to athletes, why not pay that to an elementary school principal?” Fraser said. Fraser wasn’t surprised when his first offer was rejected. But the company agreed to send 40 free pairs of the shoes instead, one for every Friday during the school year. Converse is still sending Fraser several pairs a year. His collection now has 104 pairs, from basic black to zebra stripes, Batman and other comic book themes, and fluorescents in every color. Fraser, 56, paid for his first high-tops, a now-worn purple pair with matching laces, while at Rose Avenue Elementary School in Modesto. To this day, students who wear a pair of Converse to school with colors matching Fraser’s can win a prize. On a recent Friday, two dozen Lakewood students took their principal up on the challenge by wearing their Converse to school. Fraser’s collection is as diverse as the personalities who have worn chucks since they came off factory lines in 1917, from punk rockers The Ramones to basketball star Larry Bird. The company, which celebrates its 100-year anniversary this year, has put decades of basketball greats, rock musicians, counterculture teens and average Americans into All Stars. Company representatives did not return phone and e-mail messages seeking comment. Fraser’s favorite pair, a solid blueish-purple, may be the tamest in his collection. He has All Stars made from gym short material, disco-stripe glitter fabric and wool. He has only one “mistake” that mars the high-top collection — a low-cut, striped pair. Fraser guesses his collection is worth about $4,000. There is only one pair that Fraser is not permitted to wear — a Christmas-themed white high-top with red bows, lace trim and ribbon.